The story of a poet and his work is perhaps one that is not often told; rather it is the poet who tells the stories. Therefore an insight into their personal world is not one that is often sought after. However, those with any knowledge of “Howl’s” protagonist and his political struggles throughout his life’s work will seek the production out. Directors Rob Epstein and Jeffrey Friedman employed a number of techniques in their imagining of the life of American poet Allen Ginsberg. Centred on the simultaneously lauded and loathed poem "Howl", Epstein and Friedman employed a variety of styles to portray the key moments in the life of the controversial poet. Ranging from black and white to full blown animation, the story of this highly political artist is particularly vivid. 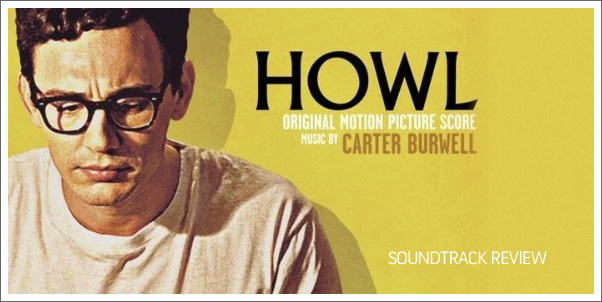 The experience of listening to CARTER BURWELL’s efforts in HOWL however is often a testing one, one that rarely rewards the listener. The music though does undeniably mirror the film it accompanies in its style and technique.